No matter what anyone says or does about 3rd party posting tools (short of Mark Zuckerberg personally and individually telling Page owners that they don’t hurt Pages), the stigma will remain. There will always be someone out there who swears that using a 3rd party publishing tool is Facebook Page suicide. And that person will probably stick in the back of your mind as you decide whether or not to sign up for a third party tool that seems very useful. I’m here to introduce facts regarding the controversy that is 3rd party posting tools on Facebook. As a disclosure, I’m a co-founder of a company that is a 3rd party publishing tool. You can claim bias here, but I invite you to check my sources. I’m going to start by admitting that there was a time when 3rd party tools were at a disadvantage by default on Facebook. As Michael Lazerow of Buddy Media (now Salesforce) noted in this post, the main issues were that Facebook was collapsing 3rd party API updates and that some of these updates were not optimized for Facebook. To take a step back to look at the collapsing issue, check out this photo from Lazerow’s article cited above. In this case, there were 173 posts from Twitter, and one was being shown. Yikes, collapsing was quite an issue. 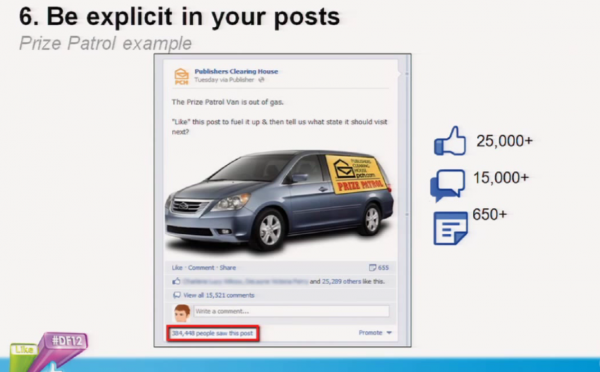 The other issue was the lack of optimization of these tools for Facebook. There were a lot of ugly posts out there. I’m sure you can remember the auto-posted RSS feeds that looked terrible. Obviously, these posts suffered. But this is all in the past. Facebook has come out and said that Pages that use 3rd party publishing tools are not punished by EdgeRank, Facebook’s news feed filtering algorithm. Brittany Darwell of Inside Facebook speculates that “it’s unclear whether the subtle note about where a post is coming from has an effect on how users respond to it” — which is a fair point, but one that is no longer applicable now that Facebook has removed attribution for 3rd party apps (in other words, there’s no more ‘via app name’). See the photo below for more clarification. The ‘via Publisher’ line no longer exists, so there’s no possible way for a user to differentiate a post via a 3rd party publisher and a post via Facebook natively. When you couple the statement above with the fact that there’s no longer a collapsing issue on Facebook and 3rd party tools are generally super-optimized for Facebook Pages, it becomes clearer that there’s no downside to posting through a 3rd party tool. Can I also bring to your attention the amount of engagement on this post (and this Page) — and yes, they use a 3rd party posting tool! It’s pretty amazing for a page nearing a million fans to have a PTAT rate of around 10%. Even more impressive is that they are this good AND they don’t spend money on ads or sponsored stories, which I learned watching this video about news feed optimization. But I know — wait, you don’t need to tell me. I can see it on your face. You’re not convinced. Let’s go back to Michael Lazerow’s article from AdAge mentioned at the beginning of this post. In this article, he shows this screenshot of a post that was created using his 3rd party posting tool. The key here is ‘via Verizon Publisher.’ If you’re on Facebook as much as I am, you’ll probably start to remember this being a very common thing for big brands. I remember seeing ‘via Sprite’, ‘via Skittles’, etc. So if all these large brands (with 7-figure Facebook ad budgets) are using 3rd party tools to post to their page, I think it’s pretty safe to say that there’s no default punishment to worry about. In addition to everything mentioned above, there have been some case studies done recently to test whether or not 3rd party posting tools are punished by default. Jon wrote about one of them last summer — a test conducted by Emeric of AgoraPulse. Emeric compared the performance of photos posted natively through Facebook and through his company’s 3rd party tool and saw no apparent disadvantage in reach or engagement posting from his tool. In fact, one of the posts outperformed its counterpart by over 35% — which leads to the next logical question. What are the Advantages of Using a 3rd Party Posting Tool? ‘Power users’ of Facebook Pages will find that 3rd party tools will provide lots of extra, advanced features that you won’t find on Facebook. These features will help you be a smarter, more efficient Facebook Marketer. Let’s look at a couple quick examples. 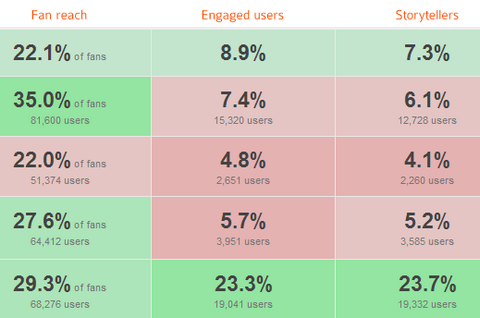 AgoraPulse: AgoraPulse provides analysis on Facebook Insights in a much cleaner way than Facebook (in addition to many other things), including collecting data on your Fans through applications. Most of what they do would require quite a bit of additional work from you if you wanted to extract this data from Facebook yourself, and some of it isn’t included in Insights at all. Instead, if you use AgoraPulse, they provide you with something like this. 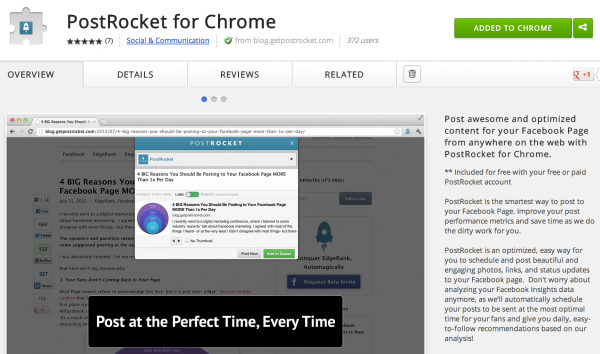 PostRocket: PostRocket (my company) makes it easy for you to post from anywhere on the web at the best time for your fans with our Chrome Extension. Rather than switching back and forth from a website to Facebook, copy-pasting links, you can just click a button while you’re on a site and voilà. There are many, many other tools out there beside the two I mentioned here, and they all provide additional value through features that Facebook doesn’t offer. So do some research, find yourself a tool that helps you with what you need to be a better Facebook marketer — and use it! Do you have a favorite 3rd party publishing tool? Let me know in the comments below! 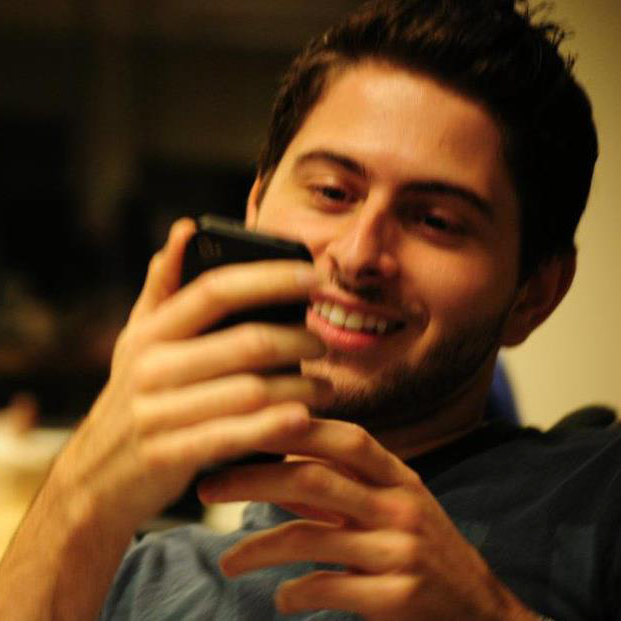 Mike is the Co-Founder PostRocket, making Facebook marketing easy for everyone. You can read more posts from him and his team on the PostRocket Blog.